Life has seemed to gotten in my way lately 🙂 I noticed that after the last Farmer’s Market of the season. I go into a cooking slump. I am realizing that is just the way it is. I went grocery shopping for the first time last weekend. It just isn’t the same as enjoying the beauty and conversations at the Farmer’s Market. I chose the store well though. I went to Trader Joe’s and just let myself wander through the store and purchase without an agenda nor a budget. Well, kinda. I am always Frugal. I have taken pictures of most of the things I’ve created in my room. I will be back on a more regular schedule soon. Happy Holidays to all and Thank you! 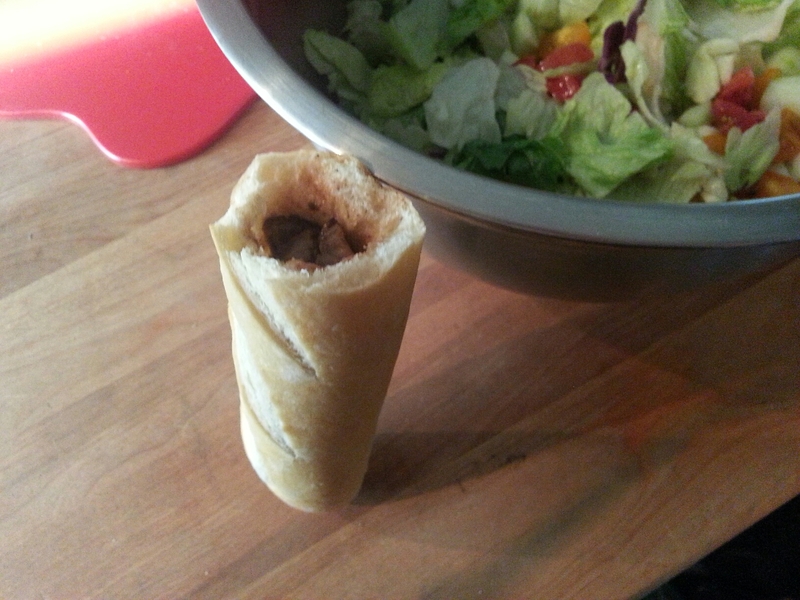 I had baked a Baguette to serve with the Monster Salad I had made for Dinner. 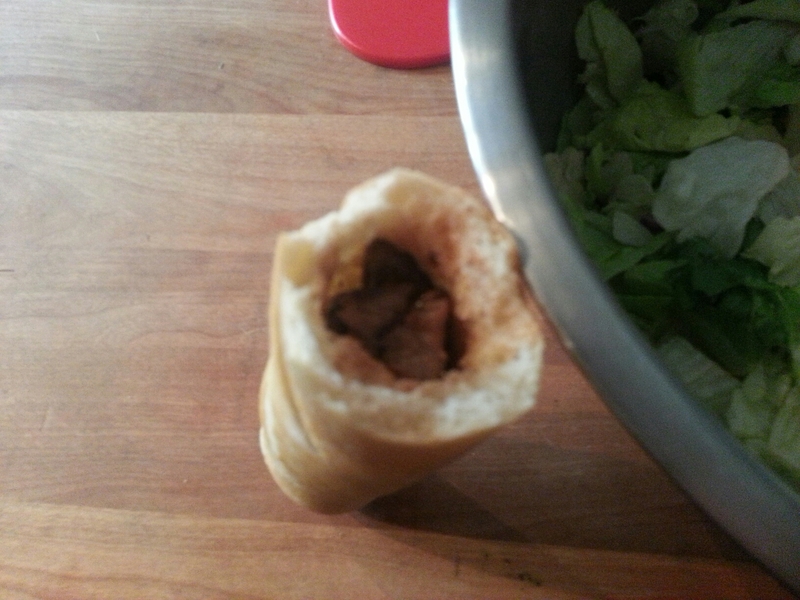 My Kid saw the Bread and the Top-Sirloin that was in the Skillet. Grabbed a large Straw and proceeded to shove it in the Bread to make a hole. Stuffed it with as much meat as he possibly could. This thing was stuffed. Oh my, it looked Yummy. Now maybe you can see how really big it was? 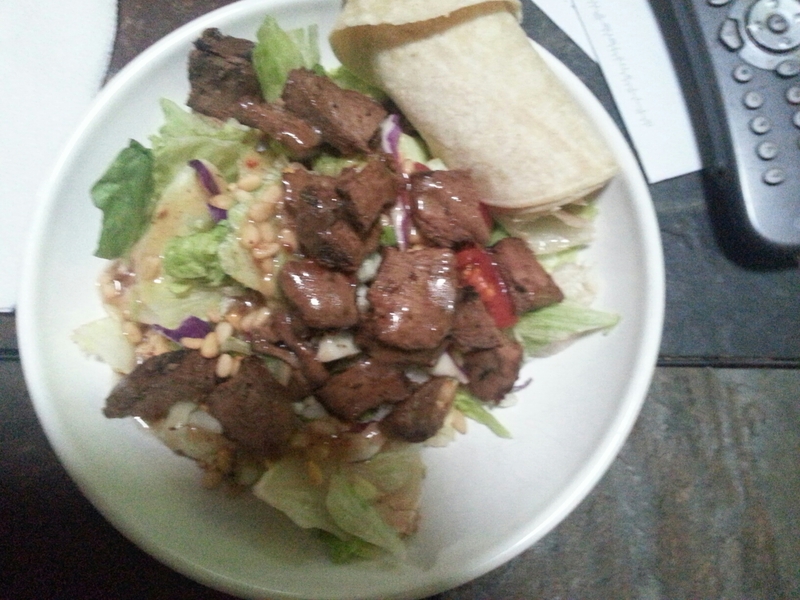 My way with Corn Tortillas and some Top-Sirloin. FYI: Vegetarian?Vegan? just skip the Meat. Gluten-free? skip the Bread like I did. Play with it. Have some fun. Have you ever gone to the market and purchased a deal. Then got home and thought “Oh Crap!!!! Well, I did that. They had packages of 3 heads of Romaine for $3.99 or 6 for $4.99. 6 it is. 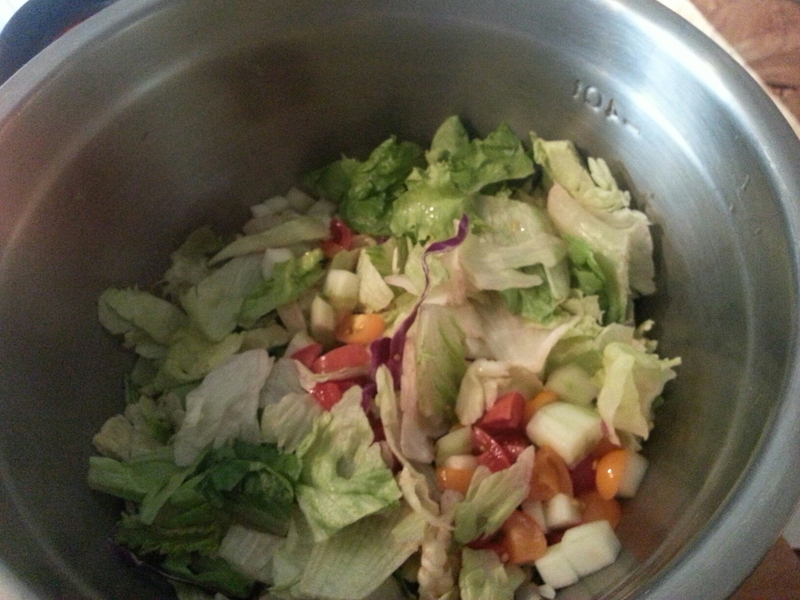 So, what better to do with 2 make Caesar salad. Croutons if you would like. I prefer baking a Half-Baked Baguette. Trader Joe’s has a bag of 2 for under $2. I keep them in my freezer just in case. 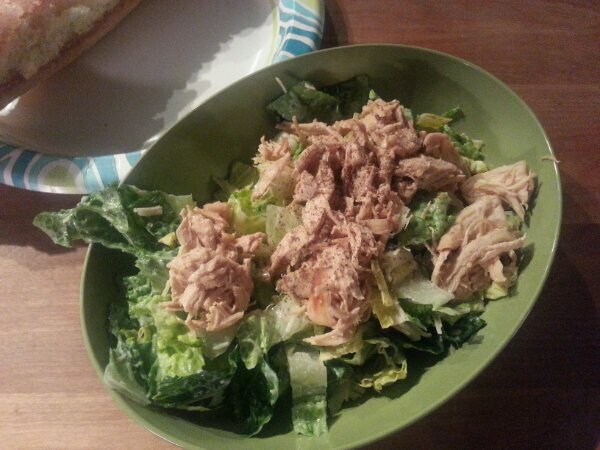 I poached kinda simmered the Chicken Breasts in a Yogurt based Caesar Dressing with a bit of water. Til tender enough to Fork Shred. Out the window. I thought I was making a simple Grilled Chicken Salad for dinner. Til I saw the bag of Salad. I won’t even go there. Needless to say I made something else. Trader Joe’s to the rescue. 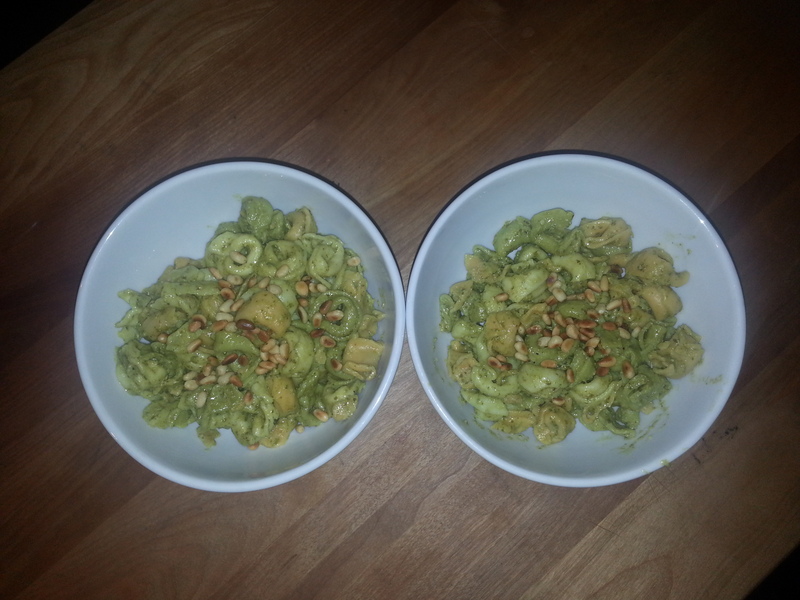 Cheese Tortellini with Pesto n Pine nuts. YUM ! The good side of this is. Guess what I’m making for dinner tonight???? There’s always a first time…..
Have you ever done this? 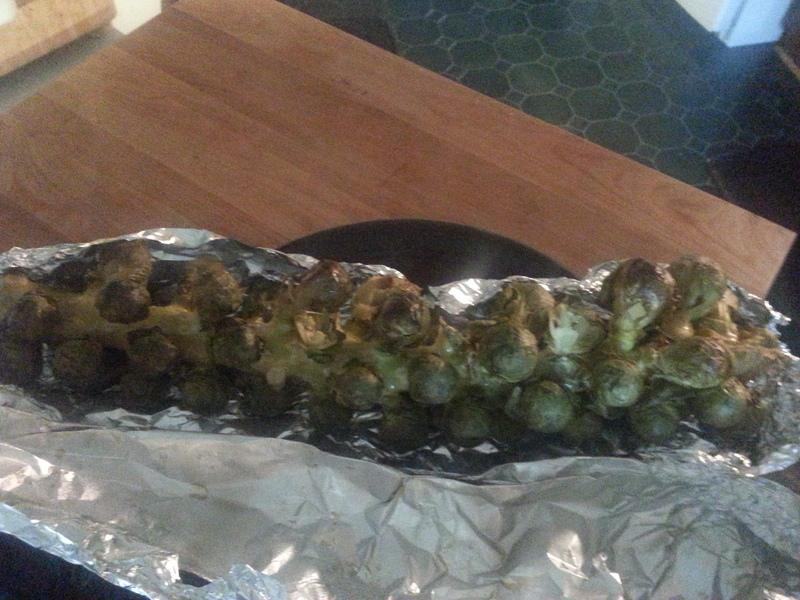 Roasted a whole Brussel Sprout stalk? ( Sorry about not scaling the pic. Just so you have some kind of idea the size. I use the same Chopping board for almost all my pics.) It’s BIG !!! The directions that were attached say to wrapped it in some kind of plastic wrap and place in the Microwave for a few minutes. Don’t know about you. But I don’t have a Microwave that large 🙂 And we know how often I use a Microwave, not very. Then it states to Drizzle with Olive Oil and Maple Syrup. Wrap in Foil and bake for 45 minutes at 350 degrees (f) or til tender. Then what?????? 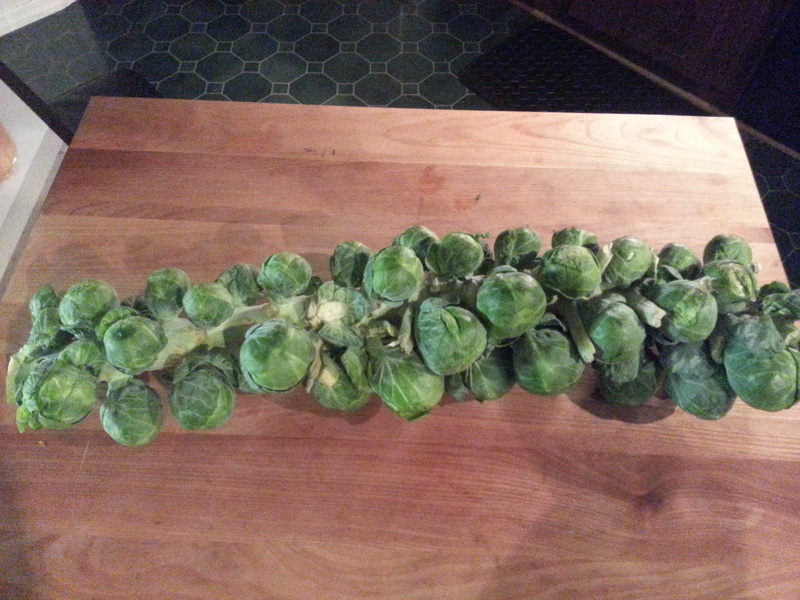 Do you only eat the Brussel Sprouts? Can you eat all that is tender? Yes. Ok, why not except for the Microwave part. Not sure how to solve that portion of the recipe. So, I decided to skip it. Which worked out just fine. It came out so YUMMY. The bad part is I am the only one that likes Brussel Sprouts. I froze some for Soup and have been snacking on the rest.I read that when serving this/these. You place the whole thing on the table and your guests take what they want. Kinda neat. I found that the stalk of the individual Sprouts were particularly sweet and the texture was of the Heart of a fresh steamed Artichoke. I will be doing this again. Maybe changing up the seasoning to a more Mediterranean flavor.